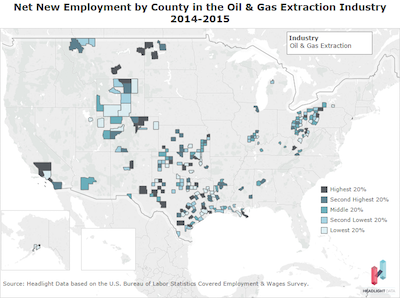 Recently released data show that oil, gas and mining job creation in 2015 across counties in the US varied from a high of 660 in Oklahoma County in Oklahoma City, OK to a loss of 1,140 jobs in Harris County in Houston, TX. 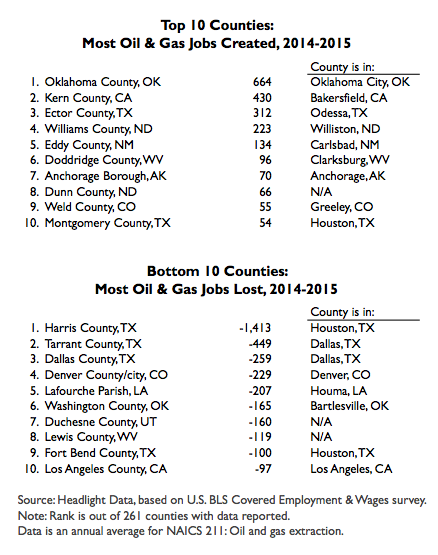 Out of 261 counties with oil & gas economies, 2 of the Top 10 are in Texas: Ector County and Montgomery County. Two are in North Dakota: Williams County and Dunn County. Kern County (Bakersfield, CA) and Eddy County (Carlsbad, NM) also created a large number of oil & gas jobs. The three counties losing the most oil & gas jobs are in Texas: Harris County (-1,413 jobs), Tarrant County (-449) and Dallas County (-259). Denver County (Denver, CO) and Lafourche Parish (Houma, LA) followed. Job creation in the Oil & Gas sector has been steadily increasing in the US. In the last 5 years, the sector grew 22% and created 34,000 new jobs. The sector currently employs 193,000 people in the US. Research, analysis and content developed by Headlight Data. Original data from the Bureau of Labor Statistics. Permission is granted to embed maps in any website. Click the “Share” button on the map to get the embed code.